Select this if you want your t-shirt shipped to you after the show. 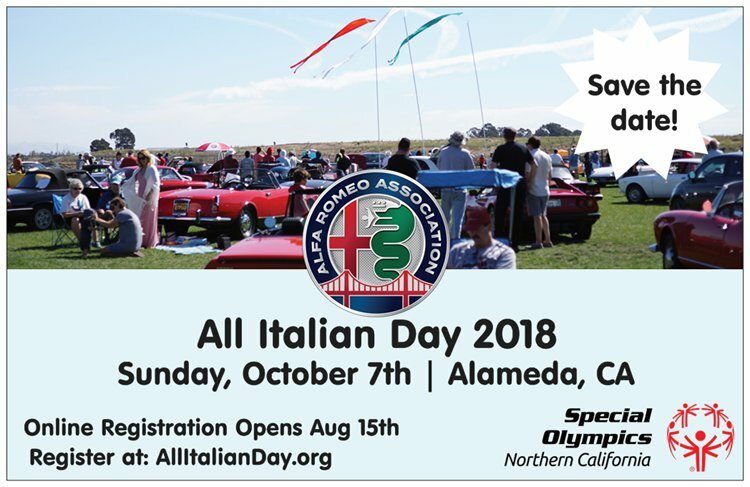 Please join us for All Italian Day with your Italian car or motorcycle in Alameda, California on Sunday, October 7, 2018. All Italian vehicles are welcome, whether a concours-ready Ferrari or a grocery-fetching FIAT wagon, new Ducati Multistrada or campus-worn Vespa. This year marks the 32nd consecutive year of this event, the All Italian Car and Motorcycle Show. Proceeds will go to the Alameda Special Olympics organizations. The cars will be exhibited on the green at Lincoln Middle School, 1250 Fernside Blvd. between the hours of 10:00 a.m. and 3:00 p.m. Italian food and drink will be available for sale. Entrance donation for non-exhibitors is $5.00 per person; fee payable at the gate on the day of the event. Children (under 18) are admitted free. There is a small donation for exhibitors and 100% of it goes to the Special Olympics. Exhibitor pre-registration is encouraged but not required. Pre-register by October 1st, 2018 and a reserved parking place will be made available for you. All pre-registered entrants also receive a personalized window card. You are encouraged to register even after this date so that we know you will be coming!